I'll be honest. This is one of those dresses I struggle a bit with. I ordered it online over a year ago and the polka dots sucked me in. It was a great price and even though I was on the fence about it, I didn't return it. I am not sure about the fit for my shape. It's really loose at the top so I typically try to cover it up with a cardigan or sweater. I've thought about tailoring it, but I am not sure what parts should be tailored or if it is worth it. Any thoughts about how to style it or if I should get it tailored or not? See how else I've worn this dress here and here. That dress is adorable! I always love the look of a dress styled with a sweater over it! Both of the other ways you styled it look great too! What does the top look like on it's own? Can you wear a tank top or cami under it and then belt it? I love how you've layered it. I have a few dresses that don't fit quite right so I always wear something over top of them. A printed dress, tights and boots are just the perfect look to me! i think you've done a fine job working with it, with the layers! Great way to remix a dress, I will try that tomorrow for work. Very cute and love that pretty green on you! Love what you've done with it in this outfit. The polka dots would have sucked me in too. Well this all works together really well! I've had a dress or two that is too loose in the top, and I usually try the same tricks, layering sweaters or cardigans over top. If you figure out what to do with it, I hope you'll share! Sorry to not have any real suggestions though! This is so cute! 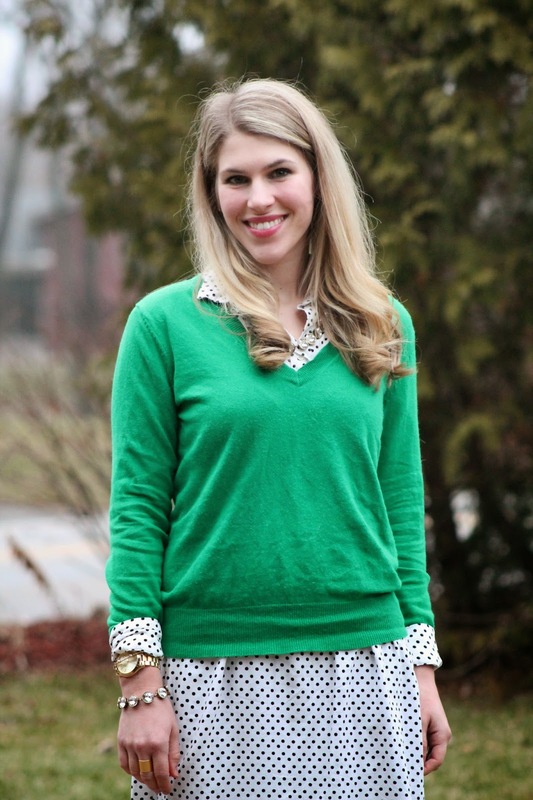 I love the polka dot dress under this fun spring-like sweater! It's bright and charming for the dead of winter! Love it! I think it looks great on you. I've had a few dresses tailored up top, and for me, the cost ended up outweighing the benefits, it's crazy how pricey that can be! Pretty look, Laura! You do layers so well! love how you styled this shirt dress for winter. You look great in green! I think you styled it perfectly--there is something about the mix of polka dots and green that I just love!! I love how you layer a sweater over a dress! 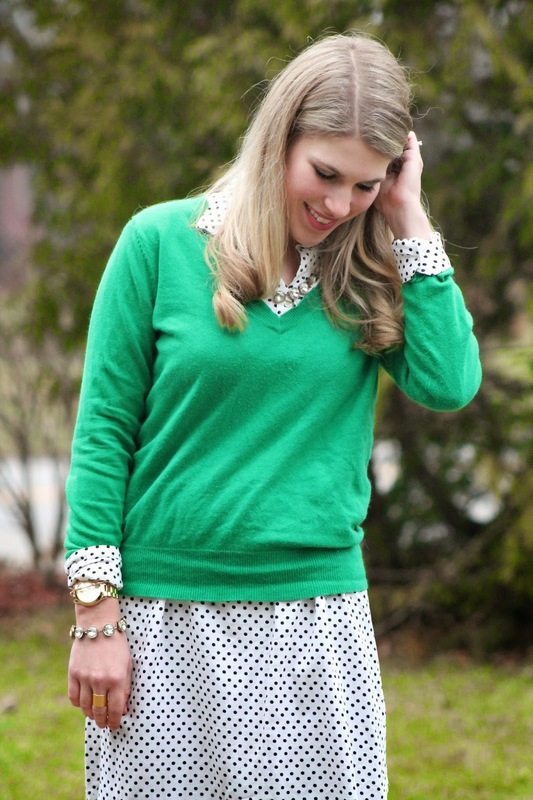 The polka dots are adorable and the green is such a pretty pop of color! Have a great day! Love this look! 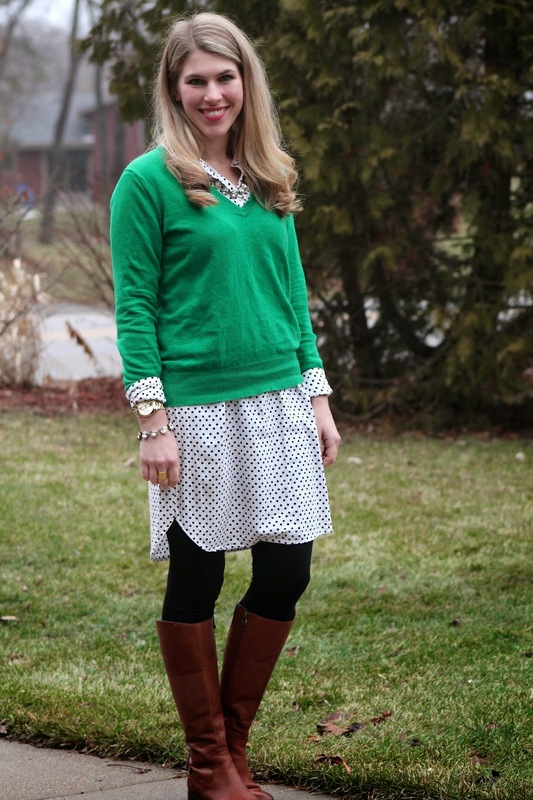 Green and polka dots - so cute! I like the way you styled it. (Is it one of those shirt dresses that are awkwardly straight/loose throughout the body?) If you were to tailor it, and it is a shirt dress, have it taken in to make it a make-shift sheath (or shift which is more fitted). But I woudn't- the combinations with throwing a sweater or cardi/blazer over the dress are too endless! 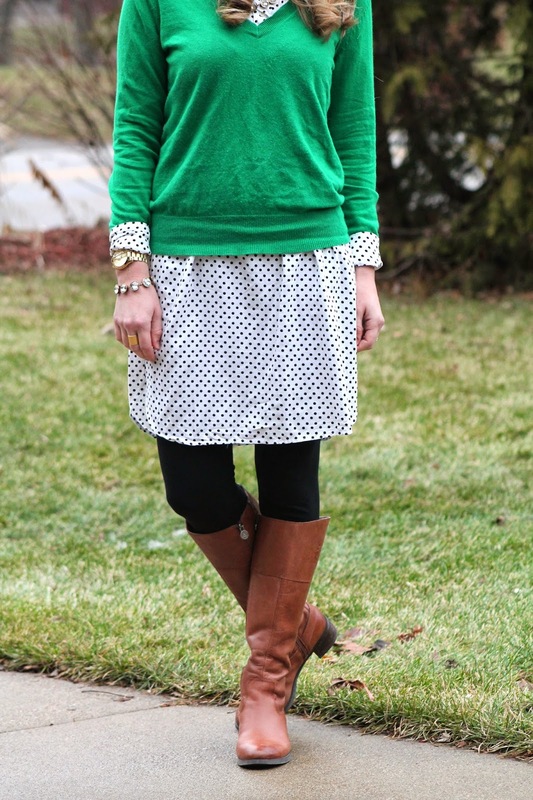 I am loving this dress with the green sweater and how you could roll up the polka dot sleeves on the dress even. So cute! I never think to wear sweaters over a dress, but it looks so great! I love the bright green colour you chose. It almost looks like a skirt and top. maybe if you tailored it at the waist. What a gorgeous post! I found you on the Weekend Snapshots LinkUp. Green looks great on you. It does look really big on you when you wear it without a sweater. I'm not sure how a seamstress would tailor it though. I think the seater over top is a good alternative. It definitely is exactly as you described! You make a good point! I am wondering if I could just put a couple darts in the back so the top isn't so awkwardly loose. I don't know what a seamstress or tailor would do, but then again, I'm not a tailor. I would suspect that they would know what to do, as that's their job? If you ever find yourself with some spare time, I'd consider asking them. Have you tried wearing it with a cardigan and belting the cardigan? Or maybe wearing another layer under the dress to add some bulk? Good luck finding a solution! Boxy dresses can be tough - but perhaps the best solution is to stop trying to layer it up and wear it as the summer dress it was meant to be - boxy and all. I have a similarly shaped dress and once I stopped trying to make it something it wasn't, I started to enjoy it more. I have the same problem with my shirt dresses. I have found that belting it is the only way to make it work for me. That dress is so, so pretty! I really want a b&w polka dot dress. Looks great with Kelly green! I love this whole layered combination you have put together. It is exactly my style! 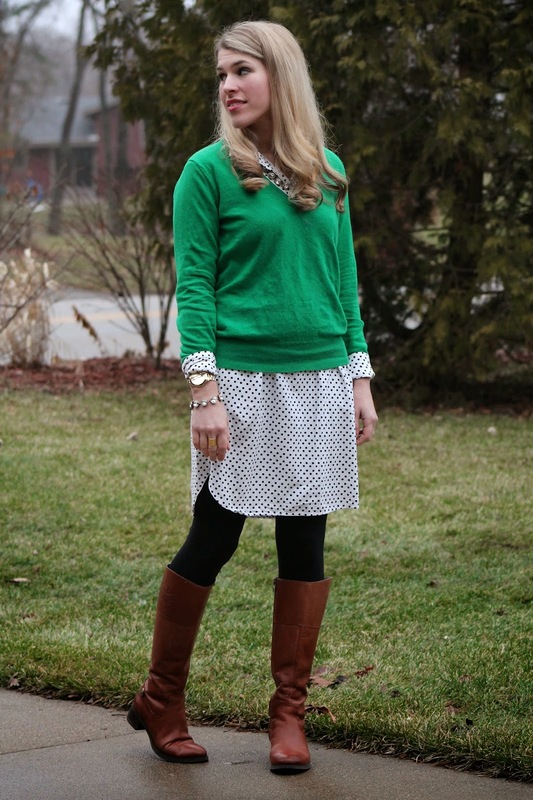 Love the green and polka-dot combo! I love the two pieces together. The dress is cute and a classic piece. Maybe if you can find a tailor who won't charge you a lot it is worth it. IDK. I rarely tailor things. I much prefer them to fit the right way when I buy them.